A little brown bat shows disease symptoms, which include lesions and a cotton-like fuzz covering the nose in this 2011 file photo. 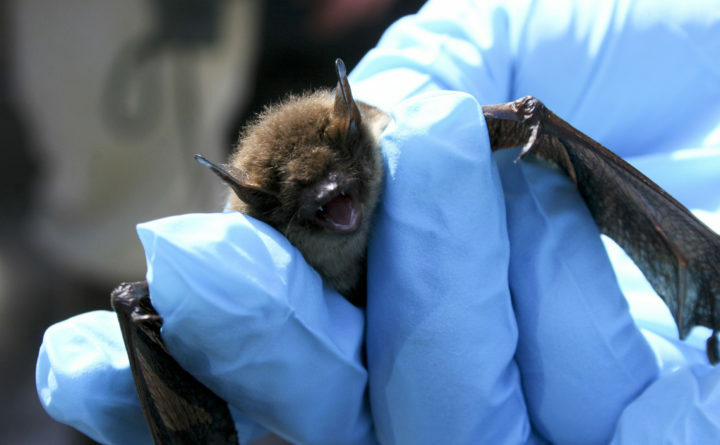 Several people in the Bangor area handled a rabid bat with their bare hands last weekend, and public health authorities are seeking the public’s help in identifying those who might have handled it. They likely need rabies post-exposure shots. The live bat was found in the vicinity of the Shaw House, the youth shelter located at Union and First streets, according to the Maine Center for Disease Control and Prevention. It was passed among several individuals who handled it with their bare hands in several locations in the Bangor area March 16 and 17. Ann Rivers, director of the Acadia Wildlife Foundation in Bar Harbor, has been involved in helping to find the 10 to 12 people who may have handled the bat without wearing gloves. The bat was taken to Rivers’ rehabilitation center and the decision was made to test it. After it was killed, the bat tested positive for rabies at Maine’s Health and Environmental Testing Laboratory, the CDC said Friday. Those who had direct skin contact with the bat, and did not wear gloves or use a cloth or other barrier, are at risk of acquiring rabies. Bats that exhibit unusual behavior — including being easily approached, active during the day or unable to fly — could be infected with rabies, according to the Maine CDC. Most bats do not have rabies. Rivers said Friday that just one in 10,000 bats gets rabies. Bats contract the virus by being bitten by a rabid animal. Injured bats and bats found in homes often are dropped off at the foundation, she said. Rivers said it has been difficult tracking down the people who handled the bat because they are believed to be part of Bangor’s homeless community. In addition to spreading the word at the city shelters and soup kitchens, churches that offer free meals once a week were enlisted to try to find people who handled the animal. Rabies is fatal but preventable if treated without delay after exposure. Individuals who had direct skin contact with the bat should start rabies prophylaxis as soon as possible, the Maine CDC said. The treatment includes two injections: one with human rabies immune globulin and the rabies vaccine. Rivers said that people may receive treatment at no cost. Rabies is spread when infected animals bite or scratch another animal or person. The virus can also be spread if saliva or tissue from the brain or spinal cord gets into broken skin or the mouth, nose or eyes. To help prevent the spread of rabies, the CDC recommends that people never touch a wild animal or any unfamiliar animal. The CDC is requesting that those who had direct skin contact with a bat in the Bangor area during the weekend of March 16 and 17 contact their health care provider to discuss the risks and determine if they need to be treated. They can also call the CDC at 800-821-5821. People who find injured bats or other animals may call Rivers for advice at 207-288-4960.